• 1887 ~ Emile Berliner patented a disk recording device that made it possible to mass produce phonograph records. • 1892 ~ The ‘King of Marches’ was introduced to the general public. John Philip Sousa and his band played the Liberty Bell March in Plainfield, New Jersey. Gershwin’s Rhapsody in Blue is featured in Disney’s Fantasia 2000. • 1908 ~ An ad for the Edison Phonograph appeared in The Saturday Evening Post. The phonograph offered buyers free records by both the Democratic and Republican U.S. presidential candidates! • 1955 ~ Debbie Reynolds married singing idol Eddie Fisher. The couple made it through four tempestuous years. • 1957 ~ West Side Story opened in New York. The musical ran for 734 performances. The loose adaptation of William Shakespeare’s Romeo and Juliet produced several hit songs, including Maria and Tonight. Leonard Bernstein was the composer. • 1962 ~ “Come and listen to the story ’bout a man named Jed…” The Beverly Hillbillies aired on CBS-TV. U.S. audiences were enchanted with Jed, Ellie Mae, Granny, Jethro, Miss Jane and that banker feller. Enchanted, as in a trance, in fact, for 216 shows. Bluegrass stars Lester Flatt and Earl Scruggs had the honor of composing and recording the theme song and hit record, The Ballad of Jed Clampett. • 1969 ~ The Beatles walked the road toward a hit LP for the last time, as Abbey Road was released in London. The 13th and last album for the ‘fab four’ zoomed quickly to the #1 spot on the charts and stayed there for 11 weeks. 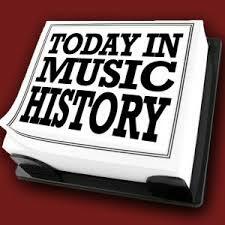 1984 ~ History was made at the Metropolitan Opera House in New York City. Neil Shicoff, lead tenor in The Tales of Hoffmann, was unable to perform due to illness. His understudy, a chap named William Lewis, was a bit under the weather as well, and his voice began to falter during the performance. So, Kenneth Riegel was called in to sing the part from the orchestra pit while Mr. Lewis lip-synced the part on stage. • 2003 ~ Yi Sung-chun, one of the most outstanding musicians of contemporary Korean classics, died at the age of 67. Born in what is now North Korea, Yi moved south during the 1950-53 Korean War and became a pioneer of Korean classics, called Gukak, or national music. Yi first entered a medical college but switched to study Korean classics two years later at the Seoul National University. He earned his doctorate and served his alma mater as a professor for 30 years. Students called him “a real model of Seonbi,” or the disciplined and well-mannered intellectual class of the old royal Korean Joseon Dynasty. Yi produced about 300 pieces of music, and helped reshape the “gayageum,” a traditional Korean instrument with nine strings, into the one with 21 strings to broaden its tones. His name was put on record in 2001 along with 30 other Korean musicians in the New Grove Dictionary of Music, an encyclopedia named after British musician Sir George Grove that lists 3,000 important music figures worldwide. This entry was posted in Composers, musicians, Pianists, Today in Music History and tagged composer, George Gershwin, John Philip Sousa, Leonard Bernstein, pianist, songwriter, Today in Music History, video. Bookmark the permalink.